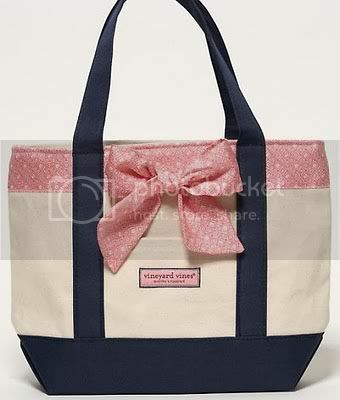 Just recently I found this picture of this adorable Vineyard Vines tote while perusing some other blogs. I decided I needed a new school tote and since Christmas just passed I might try to make one of my own! I found the blue bag and some pink ribbon. The only thing that will be missing is the vineyard vines logo, but I'm thinking of replacing it with my monogram! I have plans with a Word document, an exacto knife and some pink spray paint. Wish me luck!